My friends have said "I want to marry this cake" to describe their enjoyment of my marble cake. When it came time to decide on desserts to make for Thanksgiving, I was happy that this dessert was requested! 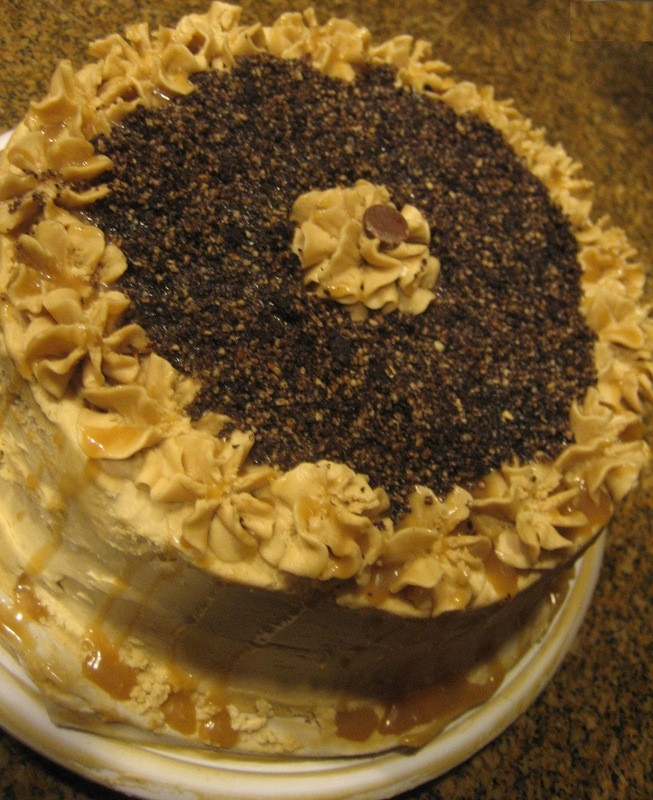 The cake is a chocolate-vanilla marble cake, and it is frosted with butterscotch buttercream with a layer of butterscotch syrup. There is a lot of butter in this cake. What is a lot of butter? Over a pound. Yes, I know: holy cow Batman. This is one of those decadent cakes for indulging on special occasions. I turned to Baking Illustrated for a base recipe for the cake. Usually, I have about 6 different types of flours in my pantry but always seem to forget cake flour. I used a combination of all-purpose flour with cornstarch as a substitute, and it has always worked well. Be sure to grease your pans well because this cake likes to cling to the pans; using parchment paper would be recommended. Homemade butterscotch is in a league of its own. Again, holy cow Batman. You'll have some leftover butterscotch syrup, which is perfect for vanilla ice cream. When I finished piping frosting onto the cake, it looked a little bare. I threw some pecans and Joe-Joe's (Trader Joe's version of Oreos) into the food processor and sprinkled the ground mixture on the top of the cake. It added a sweet, nutty crunch to the butterscotch. Next time you are looking to indulge, consider this cake. Have a great week end! For the cake, adjust the oven rack to the lower-middle position and preheat the oven to 350ºF. Generously grease two 9-inch round cake pans. Beat the eggs, milk, and vanilla with a fork in a small bowl. Combine the flour, sugar, baking powder, and salt in the bowl of a standing mixer. Beat the mixture at the lowest speed to blend, about 30 seconds. With the stand mixer running at a low speed, add the butter 1 piece at a time. Mix until the butter and flour being to clump together and look sandy and pebbly, 30 to 40 seconds after all butter is added. Add 1 cup of the egg mixture and mix at the lowest speed until incorporated, 5 to 10 seconds. Increase the speed to medium-high and beat until light and fluffy, about 1 minute. Slowly add the rest of the egg mixture taking about 30 seconds. Stop the mixer and scrape the sides and bottom of the bowl with a spatula. Beat at medium-high speed until thoroughly combined. Divide the batter equally between the prepared pans. Add one tablespoon of cocoa powder to each pan, and use a butter knife to swirl and create a marbled design. Bake until the cake tops are slightly golden and a toothpick come outs clean, 20 to 25 minutes. Cool on a wire rack for 10 minutes, and run a knife around the pan perimeters to loosen. Invert one cake onto a large plate, and reinvent onto another wire rack. Repeat with the other cake. Allow to completely cool before icing. For the buttercream frosting, melt 8 tablespoons of butter in a medium saucepan over medium heat until it turns a deep golden brown, about 6 minutes. Add the brown sugar, cream, and salt, and stir constantly until the sugar dissolves. Bring the mixture to a boil, and stir constantly for about 3 more minutes. Transfer the mixture to the bowl of a stand mixer fitted with the paddle attachment, and beat it at high speed until the bowl feels cool to the touch, about 10-12 minutes. Add in the vanilla extract or rum. With the mixer running on medium speed, add the remaining butter, one tablespoon at a time, and beat until incorporated. Continue to beat the mixture until it is smooth and creamy. Add the confectioner's sugar to achieve a thick, spreadable consistency. Cover and refrigerate until ready to use. For the sauce, add the brown sugar, butter, corn syrup, and salt into a medium saucepan over medium heat. Cook and site constantly until the sugar dissolves. Bring the mixture to a boil and cook for 2 minutes, stirring frequently. Remove the mixture from the heat and mix in the cream. Return the saucepan to the heat and cook for 2 minutes longer. Allow the syrup to cool until it is look warm. Once everything is cooled, place a layer of frosting on top of a cake, and add a thin layer of the butterscotch sauce. Place the other cake on top, and spread a thin layer of frosting over the entire cake. All the cake to sit for about 15 minutes before frosting further; this will help "glue" crumbs down and will make frosting the rest of the cake easier. For the optional garnish, grind the pecans and cookies in the food processor. Once set, decorate the cake as desired.